Since the inception of Family Water Alliance, the Farmers Feed America signs along north state highways have served as an educational tool to remind Californians where there food comes from. California farmers grow more than half of the nation’s fruits, vegetables and nuts. With approximately 88,000 farms and ranches, California agriculture is nearly a $36.6 billion dollar industry that generates $100 billion in related economic activity. 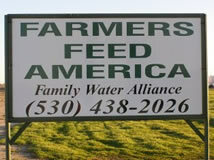 If you have land on one of California’s busy highways and would like a Farmers Feed America sign, please contact Family Water Alliance.